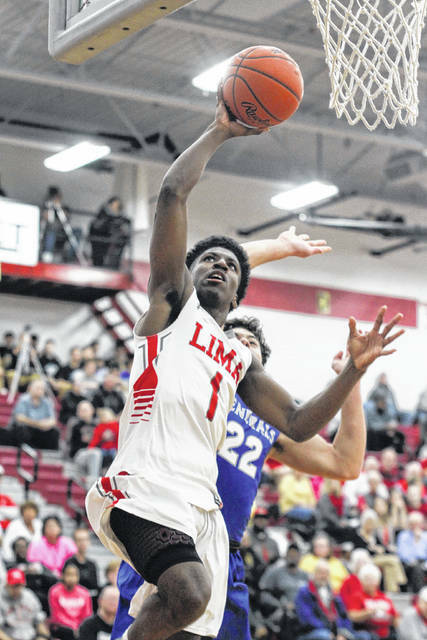 Lima Senior’s Bryan Miller Jr. puts up a shot during Friday night’s home game against Anthony Wayne. Lima Senior’s Jaleel King looks to make a pass during Friday night’s home game against Anthony Wayne. 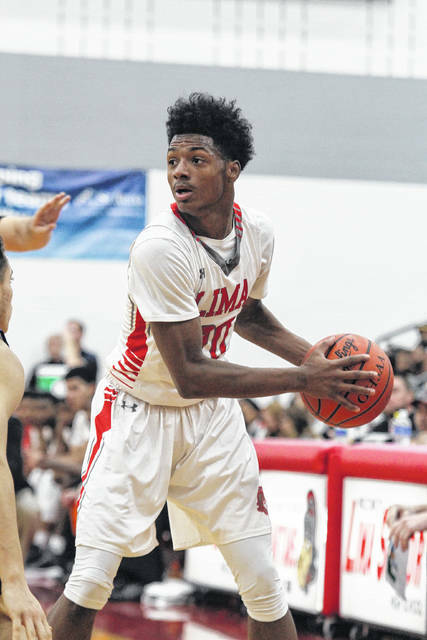 LIMA — Lima Senior freshman Jourdyn Rawlins made his debut against Anthony Wayne and it is one he will remember after his spectacular double-pump layup with 27.5 seconds left propelled the Spartans to a 64-63 overtime win Friday night. Spartan head coach Quincy Simpson said he was happy to escape with the win and said this team still has a lot of work to do to get to get into shape. Simpson added that with Rawlins starting at the point they are some growing pains he is going to have to go through before adapting to varsity ball. Rawlins, who should flashes of brilliance as well as faults throughout the night, came up clutch in the extra period and the freshman finished with seven points. Simpson also pointed out that the Spartans missed 16 free throws and still came away with the win. Going into the second half, Lima Senior owned a two-point lead, 32-28, and after outscoring the Generals 19-10 in the third period open up a double-digit lead, 49-38, going into the final period. But Anthony Wayne, riding the hot shooting of Max Denman, fought their way back to within three, 60-57, with 10 seconds remaining and then forced the game into overtime when Andrew Murphy popped a buzzer beating 3-pointer to send it into overtime. Spartan B.J. Miller led the team in scoring with 19 points including going 5 of 8 from the free thrown line in the fourth quarter. Spartan Jaleel King scored 15 points and was a beast on the board by snaring 13 rebounds. The Spartans’ rebounding was also a big key to the win after outrebounding the Generals 33-17. Generals’Max Denman was the top scorer in the game with 26 points and it was his four 3-pointers in the second half that led the Anthony Wayne comeback. Reach Jose Nogueras at 567-242-0468 or on twitter at @JoseNogueras1.